The older camcorder models used MiniDV tapes for recording their videos files. The MiniDV ( Mini Digital Video) is an analog format that gets degraded with time. So if you have these MiniDV tapes and want to preserve your videos, converting them to DVD is an ideal solution. You can transfer your old tapes into digital format on your PC and then burn them to a DVD. Mini DV to DVD conversion also creates a backup of your special event videos which you can enjoy watching with your family on a big HD TV. Looking for how to convert mini DV to DVD? You are on the right page as we help you with the apt solution. To cherish your videos for a long time and to add a dash of personalization, convert mini DV to DVD. There can be varied solutions to transfer mini DV to DVD, but the most straightforward and the simple one is to use a DVD recorder. While using this method, you simply plug the output cable from your MiniDV camcorder to the input of your DVD recorder. Depending upon the type of camcorder you have, the video connection option and the output cable may vary. Though the first preference is to use a Firewire, if not available you can also go with HDMI Cable, S-video, or RCS Audio-Video Cable. Step 1: Using the available connection cable, connect the output of your camcorder to DVD recorder’s input. Step 2: Insert a blank DVD into your DVD recorder and wait for DVD to load fully. Next, insert the MiniDV tape that you want to convert to DVD into your camcorder and select the type of input that is used for connecting MiniDV. Step 3: Press play on camcorder and record on DVD recorder simultaneously. The playing video will start getting recorded on inserted DVD. Once the recording is complete, stop the camcorder and the DVD recorder. Looking for a good DVD Recorder but confused with the options available? No worries as we have picked the 10 best recorders of the year. In the following part, know about these devices and also the purchase link for quick ordering of the one. This is one of the best selling DVD recorders and comes with HD digital Single tuner Using the recorder you can also record over the air HD broadcasting programs. Its 500GB of hard drive allows recording 500 hours of HD content. If additional storage is needed, it can be increased using the USB port. Using this Magnavox model you can record to multiple sources including DVD, External HDD, and HDD. Option to pause and Rewind Live TV is also there. This is another best seller on the list which is a combination of VCR and DVD recorder. Measuring 10.3 X 17.2 X 4 inches in size, it weighs around 9.33 pounds and features Dolby Digital Stream Out. The device allows1080p upconversion from HDMI output and also facilitates archiving home movies from VHS tapes to DVD. Line in recording through cable satellite box is also supported. The recorder has 5-Speed for the recording of up to 8 hours. Additional features include Hi-Fi Stereo, one-touch recording, and HDMI output. This is a pocket-friendly model from Toshiba that comes packed with all your required features. 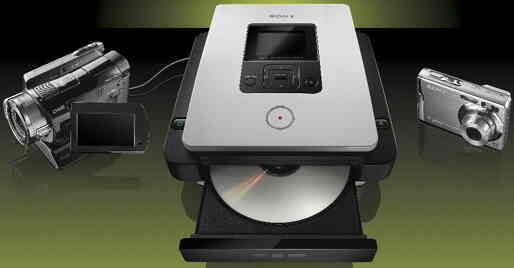 The device features multiple playable disc types including DVD+R, DVD+RW, DVD-R, and DVD-RW. It can also playback MP3-CDs and standard audio CDs. The one-touch recording feature of the device makes the entire process quick and easy. Additional features include Auto Finalization, HDMI output with 1080p upscaling option, front panel DV-input to connect camcorders, and video progressive scan 3:2 Pulldown. Another popular model from Magnavox is its MWR10D6 DVD Recorder. Physically the device measures 9.6 X 17.1 X 2.6 inches in size with a weight of around 5.85 pounds. The model is easy to use and comes with DVD+R/RW Recording Progressive Scan DVD +R/RW playback. It has component video output with front A/V inputs digital audio out. If budget is not a constraint and you want a feature packed device then Sony DVDirect DVD Recorder VRDMC5 will be a good option. This recorder has a full support for 4:3 full screen and 16:9 widescreen videos and features Dolby Digital 5.1 surround sound. This Sony model can be connected to almost all types of camcorders, VCR, and also DVRs for direct recording of the videos to DVDs that can be played on all types of DVD players. For the popular camera memory card types, there are card slots so that you can directly record images and create a slideshow. Another name in the list of top rated DVD recorders is Panasonic DMR-ES25S which offers flexibility when it comes to recording media option. There is a complete range of recordable DVD media supported by the device including DVD-R/RW. DVD+R/RW, and DVD RAM. The FireWire port of the model supports direct dubbing from the camcorder and it also allows TV program recording with 7-day TV guide option. The Optical digital audio out of the device facilitates Dolby Digital and DTS surround sound. The HDMI digital audio/video output can up-convert the DVD videos to almost HD resolution. This is another decent model that supports recording as well as playback of DVD R and DVD RW discs. The device also supports recording of VHS tapes so that you can convert your old favorite collection of VHS into DVD format. The model also supports playing other file formats including MP3, JPEG, DivX, and WMA. There is an option to record TV programs and up to 12 programs in a month can be recorded. The HDMI cable allows to improve picture quality and facilitates 1080p upconversion. Bi-directional dubbing and selective progressive scan mode are the additional features. The Panasonic DMR-EZ17K DVD Recorder is a top rated device measuring 10 X 17 X 2 inches in size and weighs 6 pounds. There is built-in Dolby digital and DTS recorder in the model. There are Multi Drive Ram and DV input for transfer. The 1sec quick start feature of the recorder makes the process extremely fast. There is also a feature of easy search and recording time slip. This is a slim and stylish DVD recorder from Panasonic which offers excellent quality and power in a convenient manner. There is a front panel DV input that allows connecting camcorder to edit as well as record videos directly to a DVD disc. The Enhanced Video Quality features that offers sharp colors and true color reproduction for the movies as well as home videos. Additional features include reduced pixel noise, upconversion of standard DVD to HD 720p and 1080i resolution, and digital optical and digital coaxial audio output for home theater surround sound. This Panasonic DVD recorder allows recording all your favorite movies, TV programs, and music. Using the device you can play all types of media format including MP3, JPEG, WMA, and DivX. There is an option of 1080p HDMI upconversion with progressive scan component. Additional features include programming timer enhancements, manual timer, one-touch recording, 12 programmable events, and others. We have some simple yet useful tips and tricks that will ensure that you have good quality discs after you complete mini DV tape to DVD conversion process. In order to preserve your high-quality DVDs for a longer time, it is important to store them in a good case which prevents them from scratches and other damages. So investing in a good DVD case is another tip to get best out of your discs during your DV to DVD process. 3. Check recorded disc compatibility with your DVD player. A lot of brands are particular with their devices and discs. For instance, a Sony DVD will only work on a Sony player. So before you proceed with mini DV to DVD service DVD, check for the DVD disc that you plan to buy and its compatible playing on your DVD player. 4. Check for the maximum recording limit of your disc. Before you start to convert mini DV tape to DVD, check the capacity of your disc. It might be a possibility that your disc size does not have the capacity to hold your entire tape video and after reaching the limit, videos may be cut off. So convert your mini DV cassette to DVD and enjoy reliving your special moments with your loved ones.